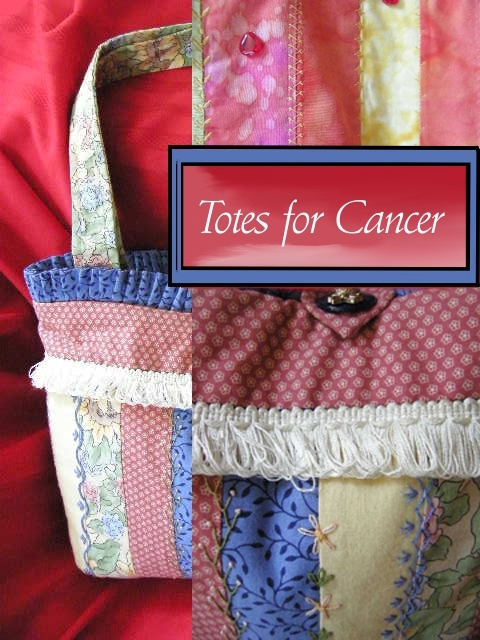 The Creston Valley Embroidery Guild has been involved with making "Totes for Cancer" since September, 2005. A need arose in the community where cancer patients were going for treatment and needed to carry medications and keep notes of their treatment. One of their members had a friend with cancer and she wanted to do something for her, to let her know that she cared. So one day eight members of the Guild got together for a workshop to learn how to make totes and "Totes for Cancer" was born. 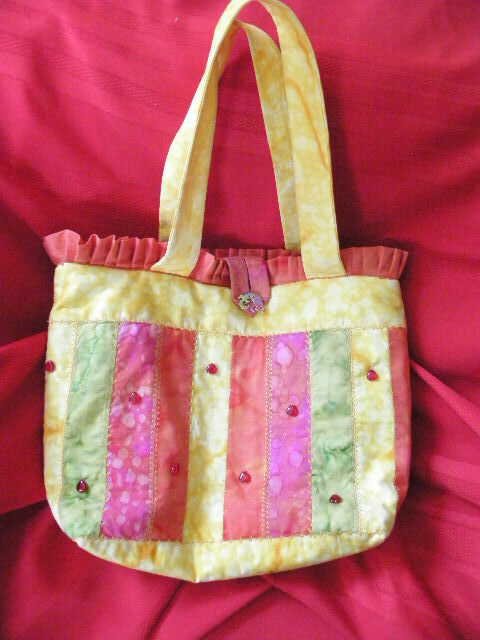 These bags are made from bought or donated fabric. The members of the Guild have produced many totes so far, with several having been distributed to cancer patients in the Creston Valley area. These totes make it easy for patients to carry all their necessities during treatment in Creston or out of town. and they contain pockets and pouches to easily accomodate many personal items. If you know of someone who lives in this area and is undergoing cancer treatment, they are eligible to receive one of these bags free of charge. If they live outside the Creston Valley area, these lovely, handmade with love, unique bags are being offered for $50 to anyone who would like to give a gift of caring. Part of the proceeds go to cancer research and part to purchase new supplies. This is not a profit making undertaking. All the members donate their time and many supplies to make these totes, ensuring a large portion of the proceeds go to cancer research. "We have asked the Guild if we could advertise their Totes on our website. I was given one of their bags during my journey with colon cancer. With my illeostomy I needed to take supplies with me all the time in case of a leaking bag and I used my Cancer Tote for my illeostomy bag. This bag and the quilt I was given from our local quilt shop which was signed by friends and family were my two most prized possessions during my surgery, chemo and radiation treatments. These two items went everywhere with me because I knew they were made with love and with a special prayer inside each and every one of them. I personally want to thank the ladies of the Creston Valley Embroidery Guild for making these Totes for cancer patients. I hope that you know just how truly special you all are for doing this.